DESCRIPTION: The William O. Douglas Federal Building was built in 1912 and is listed on the National Historic Register. This building is an excellent example of Second Renaissance Revival architecture, a classically inspired and dignified style that conveyed the stability of the federal government. 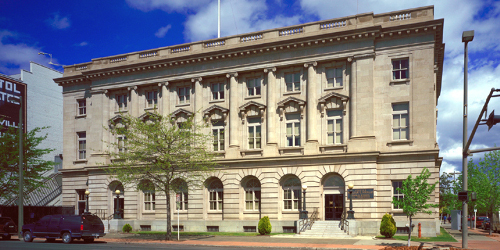 This project included design of a fire alarm system replacement within the building which still operates as a federal courthouse and includes a branch of the US Marshals. Specific courtrooms are architecturally sensitive and required detailed requirements for device placement. Design challenges included device placement and conduit concealment around many of the historic architectural features, including the many beamed and coffered ceilings of the main courtrooms hallways. Additional requirements included providing interface and auxiliary voice command center locations within the US Marshal’s office to allow for supplemental notification and control during emergency situations.